At EmbroidMe Nerang, we take the time and offer a consultative approach to help make the job of selecting and organising your decorated apparel simple, yet with impressive results. We care about the impression your brand makes. Featuring in-house embroidery & garment prints, we can offer the assurance of a well-supported national franchise, professional service, quality apparel and fast turnaround times. 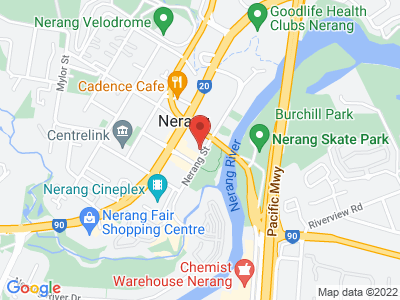 Our show room is conveniently located on Nerang Street in Nerang, displaying a great variety of apparel to choose from suitable for all industries including Workwear / Corporate wear / Active wear / Hospitality / Healthcare / Knitwear / Promotional products & apparel / Educational / Not-for Profit and many more. Didn’t find anything in the showroom that suited your needs? No problem! Being part of a successful national franchise gives us access to a wide range of suppliers nationally, enabling us to source your special requirements. Upon placing an order with us, we can arrange a fitting for your team if needed, before customising with your logo for added confidence and convenience. Do you want to stand out amongst your competitors? Do you want to get noticed? Do you want to know what you are getting before you buy it? Contact us for a peace-of-mind approach to your garments requirements. "Jase and the crew at Embroider me Nerang were awesome. Nothing was too much trouble. I went with embroidery on front and had to go digital print on back. Easy to work with, the uniform was spot on, delivered on time and it was really affordable. Will be using them again for staffs uniforms, guaranteed!" Love dealing with Jo and Jase at 'Fully Promoted' - they love what they do and go out of their way to help and make sure you have the right solution! And they're awesome people too! So thrilled with the shirts that I ordered for my business from EmbroidMe Nerang. Their attention to detail and customer service are second to none. The quality of the print and colour matching was amazing and so much better than some shirts that I had previously ordered from an online vendor. The turn around time was really fast and communications was great. Thank you so much for all of your help and great personal service. If anyone is looking for new work shirts or team wear. Please go to the Gurus at EmbroidMe Nerang they went above and beyond yet again. The service is absolutely amazing. Cant thank you guys enough. So Happy with the result. Jase and the Team at Embroid Me Nerang were fantastic to deal with! From the Intial visit consultation to product delivery I couldn't of been happier with the service provided and the product supplied. The CarCraft Mobile Mechanics logos look fantastic on the shirts and we get complements all the time on the quality embroidery. Thanks to Jase and staff I wouldn't hesitate to recommend them to anyone! Jase and Joanne nailed it with the shirts we purchased. Right product at the right price with the service expected of a family run business. I’ll be back! The team at Embroidme Nerang were extremely helpful and product knowledge was of a high standard, recommending the correct shirts for our business. They provided sample embroidery to ensure the logo was 100% correct before proceeding and everything was delivered on time as promised. Will continue to use Embroidme Nerang for all future uniforms. Really happy with the hats I got embroidered for my business, they turned out perfect. Highly recommend them! Highly recommend EmbroidMe @ Nerang. Customer service is 2nd to none. Staff are amazing - we would not use anyone else. All our uniforms are supplied and embroidered by embroidme Nerang always on time with exceptional customer service , I highly recommended these guys for all your garment needs. Always prompt, friendly and professional service. highly recommend. I have used these guys a few times now and they go above and beyond. I dropped shirt off on Friday morning to have some embroidery work done and it was ready for pickup within 2 hours. Awesome turn around time and quality of work was second to none. The service was excellent and most important friendly, I did not feel pressured and Jase was willing to show me as many garments as needed to make my choice. I highly recommend them! Thank you. Customer Service is excellent, great price and always advising on quality of shirts. We are happy to recommend this company!! !